In an earlier article, How Europe almost ran out of timber and how it relates to peak oil, we talked about how the world will run out of oil. The reason is that oil is an is not an infinite resource since all oil available today was created millions of years ago. Now we are going to try to see if we can see any signs of peak oil today. To our help we will try to use as much data as possible. It was not an easy task to find all the data and it will also be problematic to use this data. The problem is that there's no definition of oil like there's a definition of gold. Oil can be of different qualities and the way oil is pumped up from the ground depends on several geological properties. But this is the data we have, so we will use it as best we can. From the graph above we can clearly see signs of some sort of oil crisis since the price today is as high as it was during the energy crisis that took place in the 1970s. That crisis was caused by a combination of a lower oil production in the US, an oil embargo by OPEC because US supported Israel during the Yom Kippur War, and the Iranian Revolution in combination with the Iran/Iraq war that caused a breakdown of Iran's oil industry. It was tough in the beginning of the crisis, but after the crisis ended, you could see how the society had adapted to the new conditions. While US as a whole became 32 percent more oil-efficient in 1985 compared with before the crisis, vehicles became 50 percent more oil-efficient. To set an example, the former US President Jimmy Carter installed solar panels on the top of the White House. "A generation from now, this solar heater can either be a curiosity, a museum piece, an example of a road not taken," Carter said. America chose the latter when the solar panels disappeared during President Ronald Reagan. The panels were not installed again until Barack Obama became the President. From the graph above we can't see a peak, only one side of a mountain. 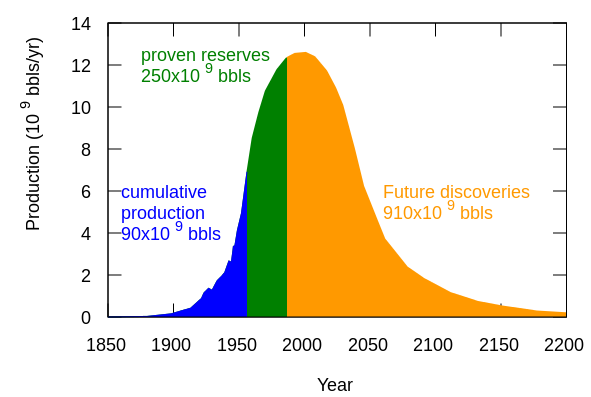 But this is not so strange since many have estimated that peak oil will happen around year 2020 - seven years from now. The current amount of oil available was estimated to 1 258 billion barrels. As the world consumed 87 million barrels per day in 2010, the remaining oil will last for about 40 years. One of the causes to the energy crisis in the 1970s was that the US oil production begun to decline. What is easy to find is US oil production data from 1859. We should be able to see the now famous peak in that graph. We can clearly see from the graph that the US oil production began to decline in the 1970s, but we can also see that the production has begun to increase again. This is because of the higher oil price that made it profitable to use unconventional oil sources, such as fracking. But don't worry, these oil reserves are not endless, so that small change in the curve above will not last for long. The US oil consumption will last as long as US can import oil. The oil supply in the graph below is defined as production + imports - exports.